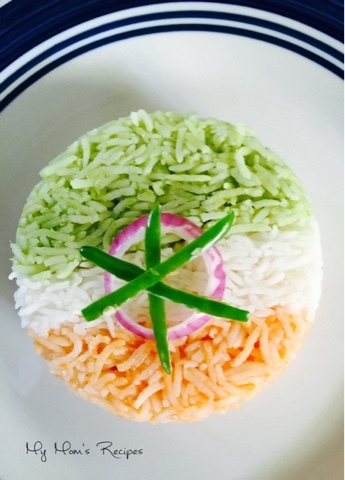 Going down the memory lane, how we use to celebrate the Independence Day during our childhood days. Flag hoisting ceremony, participating in various cultural programs, getting sweets and a half-day holiday, was more than enough for happiness and excitement. The National Flag is hoisted by the Prime Minister of India on the ramparts of Red Fort, Delhi after which his speech is followed. People celebrate this auspicious and significant day with full patriotism and enjoyment. Families and friends meet and have dinner together or go out to have fun or just relax at home watching old or new patriotic movies. At my home, my father used to bring special sweets, called 'Jalebi' with some savory snacks, complimenting each other and the occasion. A late sweet n savory breakfast with family and friends, accompanied by my Mom's special dish - Basmati Rice Pulao, was a fixed routine of celebrating Independence Day at my place. Till date, the same routine is followed at my home, back in India. 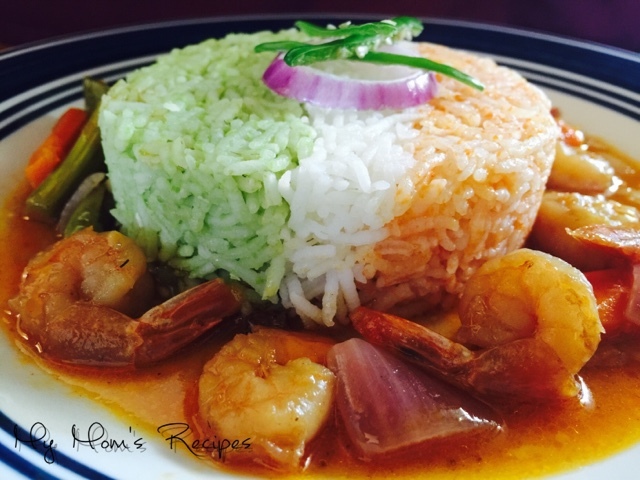 To relish the beautiful memory and taste of my Mom's Pulao, and to enjoy something different as food, I start my day from my kitchen making an item that reflects "The Colors of India"
Today, I prepared a Colorful Pulao with Shrimp Red Curry. 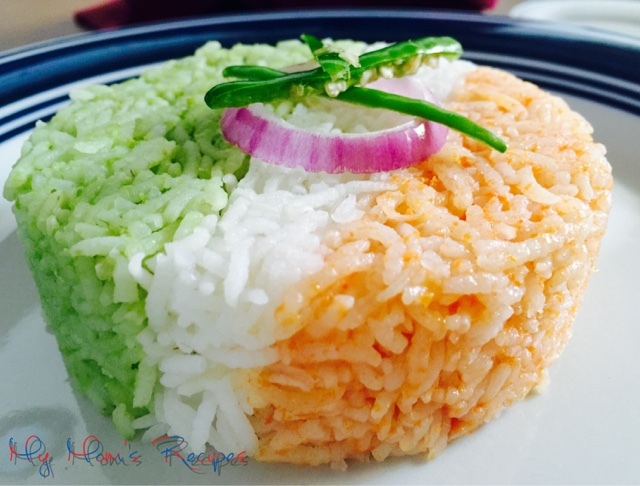 An easy recipe - Basmati Rice prepared in three parts - with Green Peas Paste, with Tomato Paste and Plain White Rice. 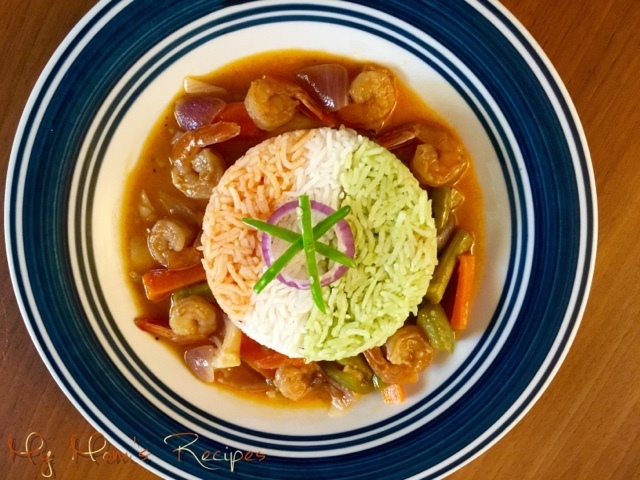 Shrimp curry, prepared with Coconut milk and veggie medley. ~Blend a handful of frozen Green peas with one one small size tomato, few green chilies and a little water. ~Heat butter/oil in a non-pan. Add the Peas paste and pre-soaked Basmati Rice, with a little salt. ~Blend a medium size Tomato to purée. ~Heat butter/oil in a non-stick pan. Add a little Red- Chili Powder and the Tomato paste with the nect bunch of pre-soaked Basmati Rice and a little salt. ~Add water. Cover and cook till rice is done. We all know how to prepare Plain white Basmati rice.